Johannesburg - New Zealand batsmen were subjected to a barrage of hostile deliveries from their own bowlers as they prepared to combat South Africa's formidable attack in the second and final test against South Africa starting at St George's Park on Friday. New Zealand were blown away for 45 in the first innings of the first test in Cape Town on the way to defeat by an innings and 27 runs. 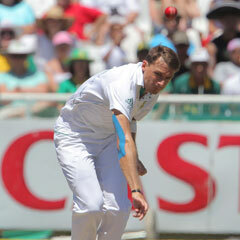 The damage was done by South Africa's pace trio of Vernon Philander, Dale Steyn and Morne Morkel. Although Philander will miss the second test because of a hamstring strain, New Zealand's batsmen will again face a formidable challenge from Steyn, Morkel, Jacques Kallis and Rory Kleinveldt, who will replace Philander. "It's hard to imagine facing Steyn, Morkel and Philander in the nets," said Martin, "but as a group of bowlers we're trying to lift the ante a little against our batters to make sure they get what they need out of training, a little more hostility, more aggression. "If you walk away having trained like that you can feel more ready to deal with the fight." The first test ended inside three days. While the South Africans were given three days off before reassembling in Port Elizabeth on Tuesday, the tourists were in the nets the day after the test ended in an attempt to lift their game before the final match of the series. There is such a wide gulf between world champions South Africa and eighth-ranked New Zealand that the host nation will drop a point on the International Cricket Council rankings if they win the series 1-0. They will only gain one point if they complete the sweep, whereas they will lose four - and New Zealand will gain the same number - if the tourists defy the odds and square the series. New Zealand are unlikely to encounter conditions as bowler-friendly as they were on the first day at Newlands. The St George's Park pitch has traditionally had less pace and bounce than other test venues in South Africa, although much could depend on the amount of grass left on the surface - and which way the wind is blowing. An easterly wind off the sea tends to favour swing and seam bowling, while a westerly from inland usually means good batting conditions. South Africa will again start as hot favourites. All of their top five batsmen are ranked inside the first 20 on the latest ICC ranking list, whereas the highest-placed New Zealander in the tour party is captain Brendon McCullum at 25. Despite the absence of second-ranked Philander, South Africa have the No 1 bowler in Steyn, while Morkel is in eighth place. Martin, at 16, is the best of the New Zealanders. New Zealand (from): Brendon McCullum (captain), Martin Guptill, Kane Williamson, Dean Brownlie, Daniel Flynn, BJ Watling (wkt), James Franklin, Colin Munro, Doug Bracewell, Neil Wagner, Trent Boult, Jeetan Patel, Bruce Martin, Chris Martin, Mitchell McClenaghan.